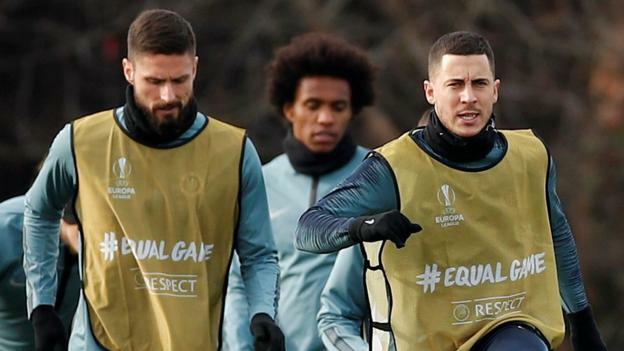 Marcos Alonso and Ruben Loftus-Cheek will be absent when Chelsea play Malmo in the Europa League last 32 on the back of a 6-0 loss to Manchester City. Left-back Alonso has been rested by Blues boss Maurizio Sarri with Emerson Palmieri likely to deputise. Midfielder Loftus-Cheek has suffered a recurrence of a back problem. Malmo have not played a competitive game since the Europa League group stage ended in December, as the Swedish league runs from April until November. Malmo manager Uwe Rosler, a former Manchester City striker, said he enjoyed Chelsea’s last game – a 6-0 defeat by City in the Premier League. “I was delighted,” the German said. “It’s not a secret my connection to and feelings for Manchester City. “I don’t think we can take Chelsea on toe-to-toe in an open game. It’s very important for us to be ourselves. I think we will get opportunities. I saw areas where we can cause them problems. “The odds are against us. The odds are £18m turnover against £450m turnover. But who was thinking Leicester would win the Premier League? Anything can happen in football. Chelsea boss Sarri says the next game is always the most important. The Blues, who are sixth in the Premier League, face Manchester United in the FA Cup fifth round on Monday and City in the Carabao Cup final the following Sunday. “Tomorrow is the most important,” Sarri said. “Then on Monday, the FA Cup will be the most important. Then we have to play the final of the League Cup, so that will be most important. Then the Premier League will be most important. “We need to have short-term targets. On Thursday the target is to have a good result. On Monday, the target will be to get to the quarter-final, then to win the League Cup. This will be the first competitive encounter between Malmo and Chelsea. Malmo have lost four of their five games against English opposition. The only exception was a 2-1 home win against Nottingham Forest in the first round of the 1995-96 Uefa Cup. Chelsea – one of seven teams to remain unbeaten in this season’s Europa League group stages – have lost none of their four previous encounters with Swedish opposition (W1 D3). Their two away games both ended goalless. Malmo are unbeaten in their last eight home games in European competition – (W2 D6. All seven of their goals in this season’s Europa League have come in the second half. Chelsea completed 3,943 passes in this season’s Europa League group stages, more than any other team and more than double Malmo’s total (1,904). Chelsea striker Olivier Giroud has scored four goals in his last three Europa League games, more than in his previous eight appearances in the competition (three).